Due to ageing process and various environmental factors our skin undergoes various changes leading to dull, rehydrated and wrinkled skin. Our advanced single or combination of treatment helps to correct the damages on the skin , stimulates production of collagen and elastin giving you rejuvenated, younger looking skin. Facial Rejuvenation is a beauty treatment that restores the look of the face. The facial rejuvenation procedures restores the appearance of skin by using a blend of beauty treatments for brow lift, eyelids lift, skin aging, facial sagging, elimination of eye bags and senile spots, chin lift, etc. The procedures are able to achieve remarkable results. 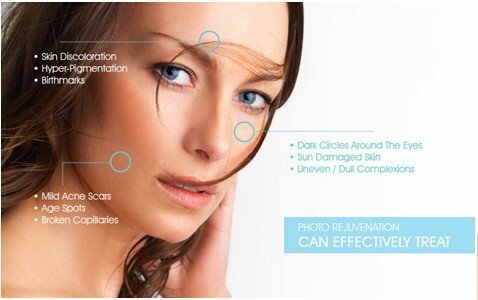 The non-invasive procedure helps in formation of new skin and tightening the skin. The clinic has pioneered in the facial rejuvenation procedures. Facial rejuvenation restores the elasticity of the skin and removes all the unwanted aging factors like senile spots, wrinkles, fat, etc. In fact, the advanced rejuvenation technologies can alter the bone structure too that plays a hand in the physical outlook of the person. Facial polish helps to mildly exfoliate and purify the skin, charmingly brightens the complexion and helps minimize the appearance of pores to reveal skin’s natural radiance. It encompasses natural clay and seaweed extract rich in minerals, nutrients and sugars, known to purify the skin. The skin polishing facial recuperates tired and lethargic skin, while countering difficulties related to cellular damage. The facial exfoliates your skin to eliminate tan and give you ultra-smooth skin. It helps to revivify the skin and eliminates dead cells. It needs to be repeated depending upon the skin condition.